Leymah Roberta Gbowee (born 1 February 1972) is a Liberian peace activist responsible for leading a women’s peace movement, Women of Liberia Mass Action for Peace that helped bring an end to the Second Liberian Civil War in 2003. 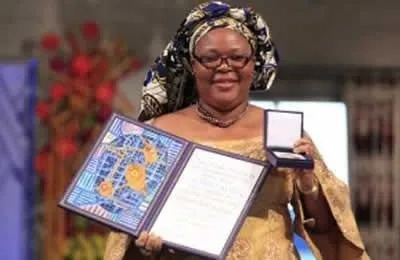 Gbowee and her allies, including a Mandingo-Muslim woman, began by “going to the mosques on Friday, to the markets on Saturday morning, to two churches every Sunday.” Their flyers read: “We are tired! We are tired of our children being killed! We are tired of being raped! Women, wake up – you have a voice in the peace process!” They also handed out simple drawings explaining their purpose to the many women who couldn’t read.